Check out our Featured, Featured NFL Free Picks for similar articles. A pair of sputtering AFC South rivals will do battle at Nissan Stadium, Nashville, Tennessee Thursday night when the 3-4 (2-5 ATS) Tennessee Titans host the 2-4 (3-3 ATS) Jacksonville Jaguars. The teams last clashed on Dec. 6 last year, a game the Titans won 42-39 at home. You can watch a recap of the game right here. The Titans opened as a 3-point favorite but the sports books have been forced to adjust the spread with 65 percent of the tickets backing the home team. You can now get JAX at a field goal plus the hook. The total has dropped significantly from the opener of 46 points and the teams are now asked to cover the total of just 43 points in order for the game to go over the total. Read more to find our Jacksonville vs. Tennessee predictions. The Jaguars had won two on the bounce before a 33-16 blowout home loss to Oakland last weekend. They outgained the Raiders by seven yards but QB Blake Bortles had a poor game and was picked off twice. He has thrown for nine touchdowns and nine interceptions this season and they need Bortles to perform in order to win. The Jaguars have struggled to establish a running game all season with just 76.7 yards per game, ranked 30th in the league. The Jags defense ranks 6th in the league for passing yards allowed per game and 9th for overall yards per game. Jaguars are 4-1-1 ATS in their last 6 games after allowing more than 30 points in their previous game. Jaguars are 3-1-1 ATS in their last 5 games following a double-digit loss at home. Jaguars are 4-10-1 ATS in their last 15 games in Week 8. Over is 4-1 in Jaguars last 5 games following a double-digit loss at home. Over is 8-3 in Jaguars last 11 games following a straight up loss of more than 14 points. Over is 5-2 in Jaguars last 7 games after allowing more than 30 points in their previous game. The Titans were also coming off back-to-back wins before suffering a 34-26 home loss as a 4-point favorite against the Colts last week. Offense was not the issue as Marcus Mariota had a decent game but they were torched by Andrew Luck who threw for 353 yards and three touchdowns. Tennessee has a lot going for them on the ball with Mariota and Demarco Murray forming a dangerous tandem giving the offense a lot of options. Murray has rushed for 633 yards has five touchdowns with three games with more than 100 yards rushing already this season and only Buffalo and Dallas are averaging more yards on the ground than Tennessee. Titans are 6-20-2 ATS in their last 28 games following a straight up loss. Titans are 1-9-2 ATS in their last 12 games after allowing more than 30 points in their previous game. 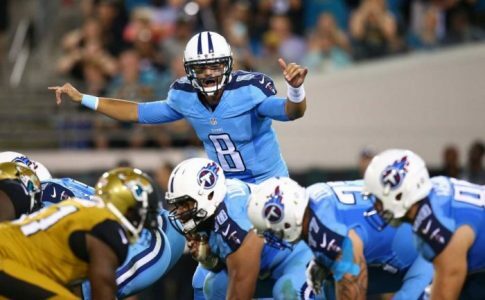 Titans are 1-4 ATS in their last 5 games in Week 8. Over is 4-0 in Titans last 4 games overall. Over is 6-1-1 in Titans last 8 games following a straight up loss. Over is 5-0 in Titans last 5 vs. AFC South.